The current investment gap is slightly larger than China’s annual GDP. For eons, cities have attracted hopeful migrants in search of economic opportunity and a better future. The age old reality on the ground, however, has usually been far less rosy. Even today, nearly one-third of the world’s city dwellers, or about 1 billion people, live in overcrowded, underserved, and dangerous slums without reliable access basic things like drinking water, sanitation, or durable shelter. For many city dwellers around the world, things could get much worse. With inadequate, mismanaged and inherently fragile infrastructure, many cities around the world are unable to sustainably meet existing demand. Now consider that between now and 2050, number of people living in urban slums expected to triple, reaching three billion. As we enter a period of unmitigated climate disruption, many of the world’s fastest growing megacities also face the greatest risk. To address this and adapt for climate change, an estimated $97 trillion of infrastructure investment will be needed from today through 2040. Based on current trends, however, total funding is expected to fall about $18 trillion short. How do we even begin to address an infrastructure investment gap that is slightly larger than China’s annual GDP? For starters, a much higher allocation of global savings held by institutional and private investors will be needed. According to the OECD, “Institutional investors (investment funds, insurance companies and pension funds) are major collectors of savings and suppliers of funds to financial markets.” In OECD countries alone, institutional investors represent nearly $100 trillion of assets under management. Distributed ledger technologies (DLTs) will play an increasingly important role in unlocking such capital by providing efficient, secure and liquid investment vehicles. Digital securities built on a DLT can expand access to potential investors across jurisdictions, using smart contracts to programmatically enforce compliance and provide access to liquidity via 24/7 global markets, providing investors secondary liquidity and instant settlement. Digital securities provide all of the same features and protections of a traditional security, with added security and compliance. DLT-enabled investment vehicles and trading platforms will transform infrastructure project finance by surfacing not only more potential investors, but also those with varying risk/return thresholds. This allows more efficient discovery, investment and trading among investors across the infrastructure lifecycle, from development through to operation. 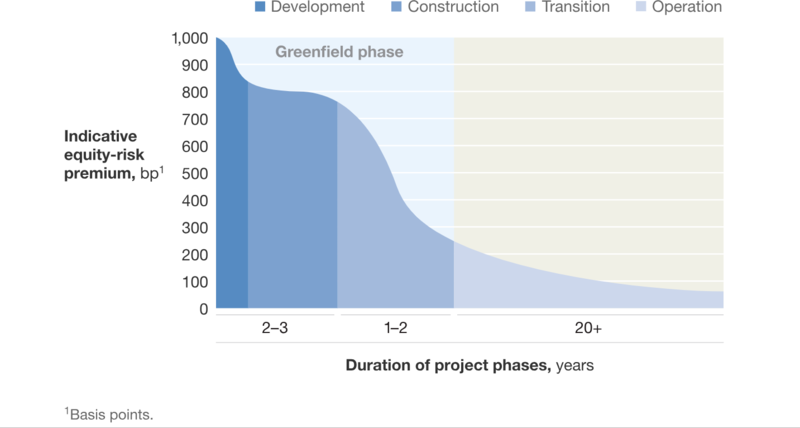 This is important because greenfield infrastructure projects do not generate revenue and the highest face risk of delay during planning and construction. Digital securities provide a means for investors willing to enter early-stage greenfield projects, potentially capturing higher returns while tolerating higher risk. Unlike traditional private securities, such risk can be partially mitigated because digital securities investors can access secondary liquidity via regulated alternative trading systems. For example, a family office or hedge fund can get involved early in a project during the primary offering when the equity risk premium is highest. Access to secondary liquidity important because it then allows such an investor to exit by trading to an institutional investor in search of long-dated assets and stable cash flows. In the United States, SEC-regulated Alternative Trading Systems such as Tzero, OpenFinance, and Templum provide secondary liquidity for digital securities investors by enabling the trading, clearing and settlement. Not only does this further broaden the pool of available investors, it also allows for a smoother transfer of securities from higher- to lower-risk investors. Through smart-contract enforced business and compliance rules, digital securities can provide access to a global pool of potential investors at lower cost. For example, a smart contract governing the issuance of digital securities to US investors can auto-enforce restrictions on their transfer to non-accredited investors, in line with local securities regulations. Additional requirements can be encoded into the smart contract ensuring compliance with similar jurisdiction-specific regulations applied around the world. Digital securities are “located” on a distributed ledger across thousands of computing nodes and are not physically stored like a paper stock certificate. In many ways, distributed ledger technology removes the need for legacy market structures organized around storing, moving and insuring physical assets. As a result, the potential to significantly reduce costs and intermediaries presents additional benefits. Longer term, distributed ledger technology allows us to reimagine how capital can work. It will take a concerted and collaborative effort by public and stakeholders to build the next generation of capital markets from the ground up. Though the theoretical benefits can offer us hope, the urgency of global systemic risk we face requires inspired and concerted action today. Despite our obsession with digitally rendered realities, the foundations of modern civilization cannot long stand without the physical infrastructure providing access to water, energy, food, transport and communications. While the sheer resilience and adaptability of our species is remarkable, not addressing widening poses grave systemic risk for both the developing and developed world. If the past few decades have taught us anything, it is just how interconnected our world really is; an environmental or humanitarian disaster in one region will trigger a cascade of destabilization throughout the global system. Peter Lyons is Chief Innovation Officer at Atomic Capital a digital investment bank uniting growth capital and exceptional investments across the infrastructure, software, and life sciences sectors.